Winter’s officially arrived and along with all its picture-perfect snow scenes, fireside hot chocolate and Cork on Ice! there are a few dreaded side effects that this season can have on your complexion, namely dry, flaky, dehydrated skin. Colder temperatures, steaming hot showers, central heating and the general lack of moisture can all play havoc with our skin but fear not, there’s quite a lot we can be doing to ensure a hydrated, glowing complexion until the first buds begin to appear again in Spring. Generally speaking your skincare routine should be adapted with the change of each season and as a rough guide, skincare products with key ingredients such as Hyaluronic Acid, Shea Butter, Plant Oils, Glycerin and Ceramides (ceramides are lipids (fats) that occur naturally in skin and for want of a better word, help waterproof your skin) will all work wonders to help prevent and treat parched dry skin. Keep an eye out too for Niacinamide, this is a skincare ingredient I’ve mentioned before in the context of minimising enlarged pores, but it also has another important function, in that it boosts ceramide production, resulting in healthier, plumper skin, less prone to irritation and redness. To keep your skin healthy, hydrated and winter-proofed you might like to consider the following skincare tips to amp up your Winter beauty regime! Gentle cleansing is a must as you need your skin barrier to be as healthy as possible so that it can retain vital moisture. As a rule of thumb if your skin feels tight after washing it is likely that the cleanser you are using has disrupted your skin barrier. Skin should feel calm and hydrated after washing, if you are reaching immediately for your moisturiser you may want to consider a gentler cleanser. 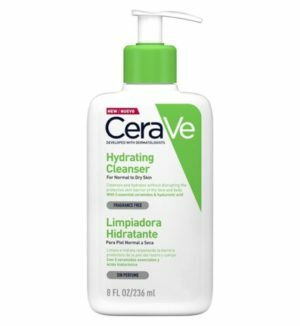 One that I have been trying and has just recently landed in Ireland is CeraVe Hydrating Cleanser. Developed with dermatologists, this is a gentle, non-foaming cleansing lotion which contains three essential ceramides and hyaluronic acid, which helps to retain skin’s natural moisture. It’s also soap-free, fragrance-free and hypoallergenic and won’t strip skin of its natural oils, which are needed to protect overall moisture. They also have one for oiler skin, CeraVe Foaming Cleanser, which removes oil without disrupting the protective skin barrier of the face and body. It too is formulated with ceramides and hyaluronic acid but has the addition of niacinamide which helps calm skin. 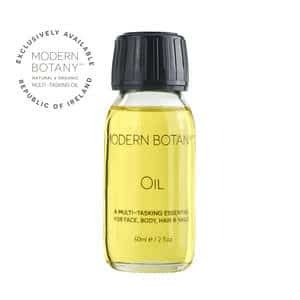 Modern Botany Oil used as a cleanser, is also great for hydrating the skin as it contains Sunflower, Avocado and Flax Seed Oils which are high in linoleic acid, a fatty acid that has been shown to improve and strengthen the skins barrier, increasing hydration and locking in that much needed moisture. Please avoid skin wipes at all costs. Not only are most full of nasty chemicals, they’re incredibly drying. Unlike a regular moisturiser, serums are hardworking formulas that have the power to penetrate deeper into the skin’s layers, helping to restore hydration and radiance in little to no time. When using, allow a minute or two for the serum to sink in before you moisturise. There’s a whole host to choose from, but these ones are especially great for chillier days. To give your skin a boost of hydration, look for nature’s “moisture magnet” hyaluronic acid. The budget friendly The Ordinary Hyaluronic Acid 2% + B5 Serum contains both low and high molecular weight particles, best for ensuring that it can deeply penetrate the epidermis. It also contains vitamin B5 to enhance its moisture-boosting abilities further. 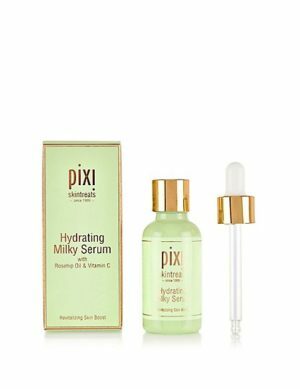 Pixi Hydrating Milky Serum is a great soothing and hydrating multitasker. The formula’s aloe vera and rose extract also make it smell amazing. It uses glycerin to trap moisture into the skin while also reducing shine without clogging pores. It also comes in a facial mist which is super lightweight and gives an instant hydrating boost to tired skin. Tried and trusted Estée Lauder Advanced Night Repair Serum is one of Estée Lauder’s most popular skincare buys, this night-time serum is created with chronoluxCB technology to help boost the skin’s natural renewal. It also contains hyaluronic acid, to help lock in moisture. Completely oil-free and non-comedogenic, it won’t clog your bores or cause breakouts, making it ideal for oily or sensitive skin types. Expect skin to be smoother, hydrated and stronger. If your skin becomes very flaky, it is important to exfoliate your skin of those dead skin cells sitting on the surface. Exfoliating will not only help rid the skin of the flakiness, but it will also help rejuvenate your skin and brighten it. The other added bonus is that now the skin is buffed, serums and moisturises can penetrate better and really get to work. Choose a gentle scrub, something with a mild glycolic or lactic acid to gently resurface your skin. Lactic not only exfoliates but it hydrates skin at the same time and the best part? lactic acid is so gentle, even sensitive skin can use it. New to the market is The Inkey List Lactic Acid Serum available from Cult Beauty or you could opt for an enzyme peel like Elemis Papaya Enzyme Peel. This is a cream peel that gently exfoliates without abrasion using the natural exfoliating fruit enzyme action of papaya and pineapple. It also contains seaweed actives and vitamin E, leaving you with a smooth, brighter, moisturised and re-mineralised skin. Don’t Forget Hands, Feet & Lips – these too are prone to dryness during Winter and the products that I always reach for are Neutrogena Hand Cream, which gives immediate and lasting relief for the driest of hands. 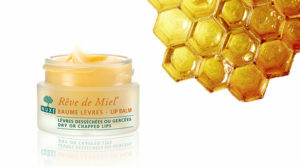 For lips it’s La Roche Posay Cicaplast Baume Levres or Nuxe Rêve de Miel Ultra-Nourishing Lip Balm. This is an award-winning balm formulated with conditioning plant extracts, anti-bacterial honey and nutritive shea butter to rehabilitate dry, chapped lips and maintain their optimal hydration levels. Feet often get overlooked as they’re hidden away in socks and boots! Foot Masks like Seoulista Rosy Toes Instant Pedicure provides much-needed TLC for your precious feet. These little foot gloves are infused with rose oil, aloe vera and beeswax to soften and nourish the skin on your feet, leaving you with baby soft tootsies after just 30 minutes. They also do one for hands, great if you have very dry hands and cuticles.